So I was talking with my daughter yesterday about some of the differences between where I grew up and where I live now. I grew up in the desert Southwest (though my early years I was bouncing around – my dad was military), in a small New Mexico town. Now we live in semi-rural Pennsylvania, and the topography is more than a little different. I was trying to describe to her the first time I saw fireflies. I was seventeen, and vacationing in Illinois at the home of some old family friends, when they all came out at dusk. I was blown away. 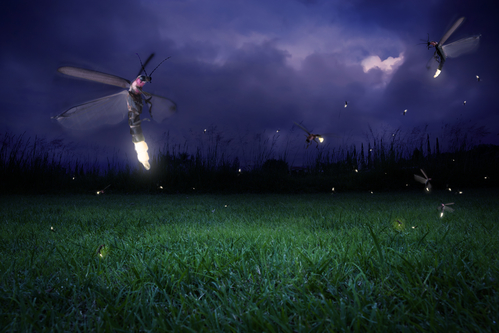 I’d heard of them, of course (except, I think they called them ‘lightening bugs’ instead of fireflies) but to actually see one – let alone a whole yard full of them – was honest-to-God just a moment of magic. So after our conversation, I sat down with my manuscript and I realized I’m missing something. Jessa has this tremendous, magical thing happen to her and while she’s suitably freaked out and off-balance by it, she’s not really inhabiting the wonder of it all. I started trying to find ways to shade that, paint it in, let it surround her. I worked on making her a little more reflective about it all – not enough to slow down the action, mind you – but she should take a beat or two to really, really feel it all and be amazed by it more. You should never let magic go by without breathing it in a little.